I know. I know. You don't even want to think about Christmas yet. But starting your Christmas preparations early, can help you have an easy and stress free Christmas. Every year we develop an unrealistic picture of what Christmas should be and how it should be celebrated. But it's not for nothing that Christmas is also known as the season of stress. One of the major causes of Christmas stress is not planning in advance. This means that when the day draws closer, you feel caught off guard. So lets start thinking about our Christmas preparations earlier, this year. Enjoy Your Successful Christmas Preparations! I have been to the supermarket at 6 am on Christmas Eve. Even now, I remember buying presents on Christmas Eve. So no, I was not always renowned for my Christmas preparations. Well, not in a good way. I'm sure you're very much like I used to be. Every year, we swear we’re going to get an earlier start. 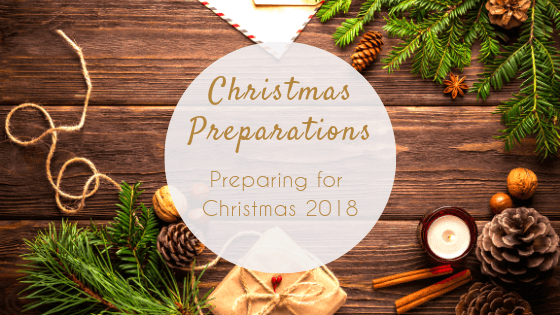 We’re going to plan ahead and yet each year, Christmas is the same frantic holiday complete with a breakneck pace of buying, wrapping, cooking, and parties. Things that are all guaranteed to overextend our time and nerves. The kind of holiday you would really love takes a lot of planning for each aspect of Christmas. From choosing the gifts (and getting them wrapped) to all of the delicious meals, and the work related events. No wonder it can get stressful! It’s enough to make even the jolliest person wish Christmas would hurry up and just pass. If you’re dreading the overwhelming tasks ahead of you this holiday season, don’t despair. Believe that you can have the kind of Christmas you want, without raising your blood pressure. And without getting so tired you feel like you just can’t function. Realise that all you need is a game plan to map out your Christmas preparations, and I can help you with that game plan. You would think with the beauty of this holiday that it would be a time of reflection. A time to sit in front of a crackling fire and drink hot cocoa and snuggle beneath a thick, fluffy throw. But that’s usually the scene on a Christmas card rather than your reality. Reality is that we’re the ones behind the scenes. Dragging in the firewood, lighting the fire, shopping for the cocoa ingredients, unpacking the Christmas throws from the attic, airing them out, giving them a wash…well, you get the picture. We’re busy enough already and life becomes even more hectic than usual on the run-up to Christmas. This means that we tend to overexert ourselves and the ho ho ho can quickly become bah humbug! With all of the activities that centre around the Christmas holiday, you need a plan to keep your stress level down. As well as keep your sanity intact. You are more than likely still working at your day job, fretting about getting the house cleaned, planning meals and shopping trips, whilst making an ever-increasing gift list. Because the Christmas holiday encompasses so many different aspects, you need a plan that will deal with each element individually. This means they work together as a whole to give you a great Christmas break, day after day. The Christmas season is almost upon us (can you believe how fast the year went by?) so you can’t put off planning another day. You need to get started right now. Make a list of what really must be done in order of importance. Then have a second column for what you’d like to get done but can live without if you don’t get around to it. Buy the same item for multiple people, especially if they’re not in the same social circle. You can buy the same gifts for people in your place of employment as you do your spouse’s. There are some great gifts that you can buy in larger quantities including gourmet food boxes. The ones containing cheeses, meats and crackers make excellent Christmas gifts. As do the food boxes with coffees and biscuits. My brother made me a chocolate hamper last year. As you might imagine, this went down extremely well! A simple idea is to buy decorative tins (no wrapping needed) and fill them with an assortment of sweet goodies. Just make sure you don’t put peppermint in the mix because it flavours everything else. You can also buy new Christmas ornaments commemorating the year as gifts. If you know what your friends or acquaintances do as a hobby or a group of special items they like to collect, you can pick those up well before the holidays. Shopping online saves you time and lets you beat the shipping crowd stress. Just don't buy more than you need as you don't have the hassle of carrying the bags home. Gosh I miss the days of going into town on the bus and coming home laden down with bags! In the rain. The number one tip to remember when it comes to gift buying is not to wait until you have to get it done. Begin right now. Shopping early not only takes the stress off by giving you more time, but it helps financially because you’re not forking over large sums of money (or putting it on your credit card) all at once. Make a list of everyone you feel you should buy a gift for. Beside each name, jot down an idea of something you know they like or might like. Starting today, begin to pick some of those items up. Some family members are notoriously hard to buy for. Instead of dealing with the question of what to get them, ask them to give you a suggestions list. Have a shopping deadline in mind. One way to beat the stress is to have a goal to be finished with all of the prep work for Christmas meals and shopping by the 1st December. It can be done if you start now. Nothing can frazzle us more than trying to rush around cooking against the clock. That frazzle factor goes up tremendously if we forget something because we didn’t plan until the last minute. There’s a way to avoid the frazzle factor. Figure out ahead of time when all of the parties, church gatherings, special meals and work related celebrations are going to be held. Take a large calendar - the desktop ones work well for this - and in the large blocks, write down the events by their due dates and the foods you’ll need for each event. Then once you have everything written down, you’ll know at a glance where you need to be, when and what items you’re bringing. Purchase all needed food items at the beginning of the month so that you can have them on hand. Pick out what outfit you’ll wear (right down to the accessories). Make sure the outfit has either been picked up from the dry cleaner or you drop it off as soon as you know about the party. Decide who will be joining you and whether they’re adults or children. Categorise your holiday meal according to the course - the main meats and side items and of course, the desserts. Make as many side dishes as you can one to two days in advance of the Christmas Eve meal. The reason most people get overloaded with cooking for the holidays is because they try to make the entire meal either the night before or the same day and then they’re too worn out to enjoy the company or the festivities. So plan ahead and don’t be shy about asking for help in the kitchen from family members. Especially your partner! Tradition, for most people, involves putting up the Christmas tree and all of the indoor and outdoor decorations at the same time. But there’s a better way for those who feel overwhelmed. The best way to decorate inside or outside your home for the holidays is to do it a piece at a time, a room at a time, a portion of your garden at a time. Don’t start in your living room. This is where the majority of decorating takes place. Begin in another room instead. Make small changes rather than doing everything in one go. That way, you get to enjoy the holiday flair. It’s often the expectation of the holiday that gives us the greatest sense of excitement as well as the actual day. Change the little decorations, the flowers, the floor rugs, etc. Replace any everyday candles with holiday coloured and holiday scented ones. In the kitchen, put out any holiday cookie containers, change over any oven mitts or towel sets and if you switch curtains, do that as well. Wash any holiday place settings - including tablecloths, runners and place mats. Take a day off and then do the living room. Set up the tree, hang the decorations and wrap the base with the skirt or decorative cloth you use. Hang the stockings on the fireplace. Put the decorative pillows on the sofa. When you’re ready to get started on the outside, do the roof lights and decorations first. That's usually the biggest job and this way, you’ll get it out of the way first. The next day, string any bushes or trees with your choice of Christmas lights. If you use more than one garden display, work on one or two displays a day until you get them all set up. Lastly, hang a wreath on or by the door and you’re all done! Since it’s still not Christmas, this should leave you plenty of time to relax and just enjoy the season and the decorations you’ve created to instil a sense of Christmas cheer to your home. We all want that gorgeous, spectacular Christmas because we chase perfection. It’s human to want to put your best foot forward. But believe it or not, it’s not always rewarding and it doesn’t always give you a sense of fulfilment. Christmas is a time for each of us to understand the special days we have with the people who mean the most to us. It’s a celebration of Christ and what this life is all about. During the holidays, we get a chance to make the most of those special days. Everyone is so busy working during the year, and this is a time we can step back and reconnect with friends and loved ones. We get to relax and laugh and reminisce. There is time to celebrate life together and hand down traditions from one generation to the next. It’s important for children to see the dynamics of a family unit. The way we laugh together, and how we cherish those special holidays. Remember that your children won’t be as impressed with the beautiful wreath as they will if you take time to sit down and play a holiday game with them. The meaning of Christmas is the way we give to one another. It's the way we take the time to appreciate all that we have in life and focus on the good in one another. Christmas is about reaching out to our circle and beyond. It’s about slowing down, taking a deep breath and holding fast to each and every special moment that comes our way. And letting the good within us spill over into the lives of others. Celebrate this Christmas season by slowing down and taking time to enjoy it. Starting your Christmas preparations early, is going to ease you into the holidays. So that they’re stress-free and more enjoyable than ever before!